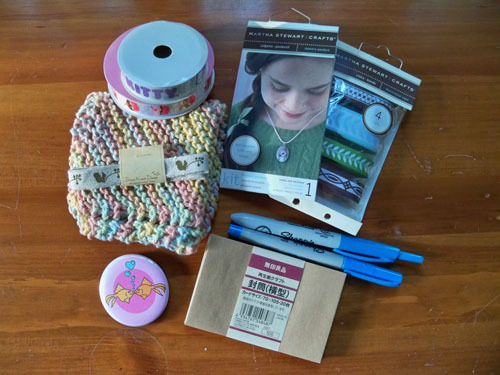 For a chance to win this fabulous prize package all you have to do is leave a comment stating what kind of crafting you do. I will randomly choose a winner on the last day of the month, September 30. Hmmm - what don't I do? :) These days, it's all about the sewing machine and the felting needles! My main crafting hobby is knitting, but recently I've been into embroidery. I used to cross-stitch when I was younger. I'm a scarpbooker. In the fall, I make mums for high school homecomings, if you're familiar with that. It's a southern thing. All my crafts are paper-based, mostly scrapbooks and mixed media. I love that room wallpapered with book pages, that's right up my alley! I knit, occasionally scrapbook, and I'd like to learn about jewelery making... oh, and sewing. Too many things are intriguing! My daughter just turned 3 and she is way into doing arts and crafts. We mostly do paper crafts (cutting, punches, glue buttons, bows, etc) right now. I make all my own greeting cards, be it for birthdays, Christmas, Mother's Day or Thank you. I love cutting out little detail pieces - it's relaxing to me, but my boyfriend thinks I'm crazy! i knit, i spin, i weave, i sew. fabric and fiber keep me breathing. i like to doodle, but i can't draw. I love knitting, spinning, crochet, embroidery, sewing and much much more. Some day I'll get a button maker cause they are too cool! I used to paint, knit, and make jewelry. Right now I like to take pictures and make photobook. It's the lazy (wo)man's scrapbook. Oh, my wedding was also very DIY and crafty. Does that count? i try my hardest to be crafty, but i am artsy through and through. i would like to learn how to knit, but i think it would just turn into knots! Little bit of everything - right now, beading! 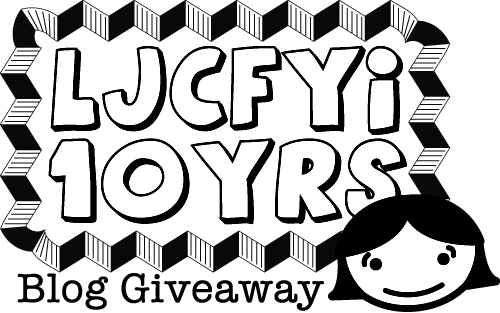 Gosh this whole give away thing is so exciting, I think I've been reading LJC almost all of those 10 years! i can't believe it has been 10 years. I've been reading for at least 9.5 when i stumbled upon your blog and read it daily. I sew, bake and love paper crafts. Congratulations on the anniversary! I've been reading for 6+ years or so. Craft-wise, I love woodworking. I like the Martha Stewart paper flower kits. I also got a beautiful MS paper autumn wreath kit on clearance at Michael's last year. I am a crafting fanatic. In fact, crafts are what brought me to your blog ao many years ago. I am currently indulging in my sewing obsession. Wouldn't my pug look super cute with a hello kitty leash? I am a crochet-ist,scrapbooker,cake decorator-I really want to try jewelry making and sewing too! Great giveaways BTW-I love themes! I'm a big on paper and printing, so Gocco, letterpress, linocuts and little book arts projects like poetry chapbooks. for crafting, I scrapbook and quilt. Havent been able to complete a quilt yet! I love to knit, paint, draw, and sew. My only problem is there is not enough time to do it all. Congratulations on your 10th Anniversary! Loves all crafts equally. But especially loves anything out of the ordinary and unique. I specialize in underwater basket weaving and backwards handwriting. Boo!~wish I had more time for crafty-ness! hi jenny, i love to craft!! currently i am knitting and sewing, but right around the corner christmas cards must be made and sent out! I sew and embroider and do caligraphy...but not as often as I wish I could! I'm crafty because I knit from time to time and try to create my own art when possible. I like to do one day crafts. One of my favorites is the Christmas wood holder from a doormat. It turned out great. I also like to scrapbook little photo books and do a little bead work. My favorite craft is collages! Cutting out paper from magazines and putting it all together in creative ways. I love making cards for holidays, birthdays, etc - such joy when i got to make all of our wedding stationary! Beads, beads and more beads..my husbands says we need a dedicated room for my beads..
Oooh I do essentially all forms of crafting, but lately I've been on a real quilling jag, which is so rewarding and so cheap! Hello, from Thailand! Oh, I would say I'm a crafting dabbler, but I enjoy & am most proud of my quilts. They're practical art! I love all things crafty! I sew, quilt, knit, crochet, scrap and spray paint miscellaneous pieces of furniture. I actually crochet but lately it seems my craft is making a list of crafts I want to make and never getting around to actually making them...it is fun to dream! I do a little bit of everything but always seem to return to knitting. I weave baskets, knit, bead, sew. Always working on several projects. I like to do needle crafts of any kind - cross stitch, needlepoint. And I am in love with letterpress - though I don't claim to have any talent in this area! my favorite type of crafting is knitting! I love paper crafts - especially when designing a party. I just learned how to can tomatoes! (Not sure if that counts, but it makes me feel crafty). Beading jewelry...with those little tiny seed beads. Holy cow I'm a crafting fool! You name it, I've done it. Although my curent favorites are knitting and embroidery. I'm finally putting together a craft room in my house and hope to be half as crafty as you. I have a brand new sewing maching in my closet that I can't wait to start using! I cross-stitch, do paper crafts, and occasional sewing. I like to sew. Hey Jenny, what kind of machine do you have. I've been thinking about getting a serger too. I knit! It calms me down..so sometimes I knit at work during lunch. I'm a cross stitcher. It seems to have waned in popularity since knitting and scrapbooking became all the rage, but I still love it. There are some GREAT designers out there! I knit and sew, with varying degrees of success. I am working harder on the knitting these days because I want to make sweaters for my mom and sister's pugs whose pudgy chests have a hard time fitting in store bought cute dog sweaters! Love your blog! I knit, crochet, sew and do beading. I alternate to keep from being bored. it depends on my mood but it varies from paper crafts to sewing to knitting to beading. i'm trying not to pick up any new craft hobbies till i use up some of the supplies i already have! I love to knit. I also like to crochet, scrapbook, macrame, loom and sew. I just have trouble finding the time! I love to knit! I also get such a calming satisfaction from painting. I decorate snail mail with my own drawings! I create birthday greeting cards for my friends & family and sew. Like most, if not all, of you here, I love all crafts. However, I am a confessed beader. I do mostly peyote stitch jewelry. I've dabbled a little bit in everything including knitting, scrapbooking, sewing, and lots of paper crafts! I enjoy scrapbooking, cross-stitching and making greeting cards! I love trying any kind of craft or art. Being creative just makes me feel good! Right now my big thing is stamping and card making. But I'm saving up to buy a sewing machine! These days I mainly knit but I tell people I have hobby ADD and have tried many different crafting projects. Congrats ljc on your 10 year blogiversary! Knitting and spinning are the eaters of free time here! I try a lot of different crafts, but my favorites are crochet and knitting. I just love seeing things crafted from my hands! Knitting, Sewing, Quilting -- you name it, I probably have the crafting supplies. Cross stitch, sewing, just took a beading class so I'm making jewelry and I'm taking a knitting class next week. Love your giveaways. :) Though I consider myself most artistic when taking and playing around with photos, I'm not sure that really counts. I sew and knit a bit and love paper crafts. I'm a scrapbooker and a stamper. I bought a sewing machine 6 months agao but can't seem to find the time to mess around with it. I used to knit all the time before I got tendinitis. Now I dabble in various things (drawing, origami, embroidery) and am hoping to find something to fill the knitting void! I'd like to learn to sew. I knit more than any opther craft, but I also crochet and sew. I will occasionally make a card or alter a book if the spirit moves me. I usually knit and sew but I've been trying to perfect a cake for my son's 1st birthday party so lately it's been all about the baking! I am making a banner though. Teal IS the color of the season, I agree. Teal and black, together. My current craft of choice is making birthday cards for friends instead of buying them. I like all sorts of crafts, but lately I've been doing lots and lots of embroidery. And quilting, which is way more fun than I thought it'd be! Last time to try to leave a comment. I like to do many, many crafts, but lately, have found time only for ATCs, origami, and friendship bracelets. Congratulations on 10 years! Hooray! My favorite type of crafting is cut-out paper projects and jewelry making! Aaack! I want this! My favorite craft is actually baking. I think that's a craft, isn't it? I do knitting occasionally and recently bought a couple cross stitch patterns because I thought it would be fun to pick that up. i love making cards-- stamping! life is too short not to tell those you love that you love them, and WHY you love them. so, i always like to do this with a nice homemade card! I like knitting, crochet, sewing, quilting, embroidery, and card making. I mostly knit, I am now on my second sweater. I also scrapbook a little and paint pottery. I make miniature sweets jewelry and I like to knit and bake, though baking may not be considered a "craft"
All kinds! I've really been into sewing lately, though. I make greeting cards for every occasion. I make tutus for my little daughter and her friends (this became a hobby after I found some leftover tulle from my wedding).